Why does Man hunt? That is not a simple question, and the answer is neither simple, nor singular. There are many good answers, and with some hunters those answers may change over time. There are several reasons that I hunt. I enjoy being outdoors. I enjoy being with animals in their natural environment. I enjoy the pursuit, crafting the stalk, the "thrill of the chase". I enjoy pitting my observational skills and reason against the challenge of finding the game, and working to get within range, unobserved and undetected. I enjoy learning from my mistakes, knowing that they will make me a smarter hunter. I enjoy working for my meat, and the sense of satisfaction that comes from having earned the meat that I put on the table. I enjoy spending time with people that set goals, and then work to make those goals happen. I enjoy using, and fine-tuning, quality tools -- like guns, knives, cast bullets and handloads. As a young man, I looked forward to the killing, as if it somehow offered proof of my virility as a predator at the top of the food-chain; but as more and more gray creeps into my beard, I have come to accept the killing as just a part of the equation -- no longer a highlight, just another step in the process. Hunting is at the core of human history and human progress, and I would no more deny myself the opportunity to be a part of that experience than I would deny myself any of the other basic human needs. In short, I hunt because I'm human. Last fall was unusual because a number of events conspired to keep me out of the hunting fields by and large. Oh I got a little bird-hunting in, and I made one trip for elk, but rather than spending virtually every free moment outdoors, gun in hand, I was trapped inside civilization for those magical months of autumn. A spring hunt was called for! I have lived in the Pacific Northwest now for over 20 years, but in many ways I am still a Southern Boy, and boy do I love barbecued pork! I hadn't hunted wild hogs in a couple years, so I decided to treat myself to a spring hunt for wild hogs. A group of us have been getting together in the mountains of central Oregon for a "Sixgunner Rendezvous" every summer for a number of years now. We've got all types that show up for this gathering -- engineers, machinists, preachers, consultants, and a couple of grizzled old retired coots thrown in for spice. We set up a large camp up in the mountains and spend a few days plinking, hiking in the mountains, socializing, and cooking all sorts of yummy stuff (biscuits-n-gravy just don't get any better than freshly baked Dutch oven biscuits with elk sausage gravy!). Every so often a few members of this group get together to do a little hunting. For this hunt I would be hunting with Steve, and Rob Applegate would be dropping in on us for a visit (but he wouldn't actually hunt). We would be hunting on Clover Creek Ranch, a rocky, hilly 2200-acre ranch in central Oregon, with elevations ranging from 2700 feet to over 4200 feet. Basalt outcroppings and junipers dominate the undulating landscape. It had been a long, cool, wet spring, and the hills were greening up, and the catch basins were full of water. The game trails showed heavy use. Steve and I met up at the cabin and were chatting when Shane (the ranch manager) pulled up. We got acquainted and Shane brought us up to date on recent happenings around the ranch. Steve and I were both looking for meat hogs (can't you just smell the barbeque? ), and Shane filled us in on where the hogs had been seen recently. Then we went in, fixed a quick dinner, told a few hunting stories and hit the rack. The next morning we were up at 5am, and pretty quickly the skillet was sizzling with sausage (made from the boar Steve shot last year), with the coffee pot gurgling in harmony. After a hearty breakfast, we headed out to hunt. We drove up onto the top of a nearby finger-ridge, parked the truck, and got out to devise our plans. We knew there was a catch-basin about a quarter mile down the hill through the junipers, and Shane had told us that the hogs were hanging out in that general area. I knew from previous experience that there was a shaded hillside above that catch basin, where the soil stayed moist and the hogs liked to root around in the soft dirt. So the plan was to send Steve down on a fairly direct route down to the catch-basin, while I would swing wide to the west and make loop down through the drainage and see if I couldn't kick anything out of the bushes. After side-hilling to the west about a quarter mile, I started to work my way down into the drainage. I broke into a small clearing and there was what appeared to be a massive, sun-bleached log, roughly 18" in diameter, lying beneath a cluster of junipers on the far side of the clearing. That "log" looked very much out of place since the entire hillside is forested with junipers that are no more than 15 feet tall and 6" in diameter, so I brought up the binocs to get a closer look. Yup, it was a hog alright, a white sow that would easily go over 500 lbs. Since Steve was hunting with an iron-sighted revolver, and wanted to get good and close for his shot, I made note of the location in case he wanted to take this sow. It was about this time that the ruckus started. Down at the water hole below, there erupted a cacophony of grunts, squeals, snarls and popping jaws. It was obvious that there was a group of hogs down below us, and that some of them weren't in the best of moods. Now things were getting interesting! I saw Steve through a break in the junipers, about 200 yards to my right. We looked at each other and waved, and started down towards the noise. We found a group of 6-8 hogs milling about around the catch-basin, most of which were in the 150-lb class. It became apparent that a couple of them were sows in heat, and that the randy young boars in the group were giving them no peace, hence the foul moods and snapping jaws. There was also a larger boar, around 450 lbs, but since both Steve and I were looking for meat hogs in the 200-300 lb class we looked this group over and ultimately decided to pass them up. We met up and discussed our options. I took Steve by and showed him the bedded white sow, but he decided to pass since she was much larger than what he was looking for. I had seen a few other hogs rooting around in the shadows below the dam, and our group had moved off in that direction, so we decided to follow them into the shadows. We found the hogs down in the woods. Our group had picked up a few stragglers and had grown in number. The 450-lb boar was trying to convince the young sows that he was the boar of their dreams and that they really wanted to bear his piglets, but they weren't buying it. The younger boars were also trying, but having even less success. As the herd was drifting through the woods, they eventually came to a stop at what was obviously their favorite mud hole/wallow. During this whole time, the hogs were staying tightly bunched, and it was hard to get a real good look at them to judge size and body type (and impossible to get a clean shot). Once they reached the wallow, and it was clear that they weren't going any further, we were able to move into a position on the hillside about 35 yards above them, where we could study them at our leisure. After careful observation, we decided that there were 3 that were in the size range we were looking for -- a red sow, a black boar and a black boar with a thin white stripe behind his shoulder. Steve had a hard time deciding which one he wanted, so he asked me to pick which one I was going to take. I chose the black boar. Steve was hunting with his Ruger Bisley Vaquero ("Bisquero") .45 Colt, and I had a scoped Contender, so I had more flexibility in terms of what shots I could take. As a result, we had decided earlier that Steve would take the first shot. Eventually, Steve decided on the red sow, and started to move down the hillside to get into position for a shot. His 5.5" Bisquero was loaded with the RCBS 45-270 SAA (a 285 grain SWC) over enough H110 to generate 1200 fps. His first shot hit her low in the shoulder, went though the brisket and exited low through the far side leg. She was hit hard, but the wound was not going to be immediately fatal, and she was still on her feet. His second shot drove through her neck and put her down quickly. It was obvious from the way that the exit wound was bleeding that the major vessels had been cut. During all this, the herd had looked up, but instead of spooking, they had just gone back to rooting around in the hillside and wallowing in the mud (that must have been some really good mud!). 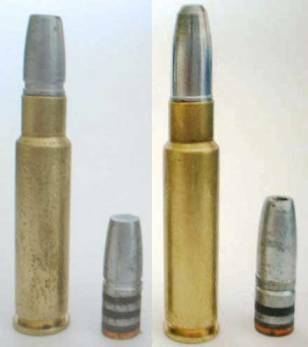 The .338 GEF loaded with the MM 235 (left) and the 33889 HP (right). Eventually, the 300-lb black boar worked his way out from the herd and gave me a clear shot presentation. He was walking downhill away from me, angling towards my left, so I lined up for a raking shot, to enter at the last rib on the left side and break the front right leg upon exit. I was hunting with my Contender, chambered in a wildcat cartridge that JD Jones and SSK Industries helped me put together back in 1993. The .338 GEF is based on the .356 Winchester case, necked down to .338, with the shoulder angle blown out to 40 degrees. I had had Mountain Molds make a bullet mould specifically for this cartridge/gun combination, a lovely 235 grain GC-FP with a .250" meplat, and I was hunting with the most accurate load that I've found for it so far (44.5 grains of 4350 for 1700 fps), not a maximum load in terms of pressure/velocity, but it's very accurate and I figured it was more than enough to hammer a hog. At the shot, he started trotting downhill, obviously hit fairly hard, but still on his feet and not showing any signs of going down soon. As I reloaded, he crossed the creek and turned to the right to climb up the earthen slope out of the creek bed. I was above him, shooting down, at a rather odd angle. I snapped the action shut and touched off the shot as soon as I saw ribs underneath the crosshairs, in an effort to keep him from escaping. This second shot hit him hard, and he lost his footing and slid down, backwards, into the creek below. I scrambled down the hillside, and dropped off my pack and Contender on the bank of the creek. As I stood over the boar lying in the creek, admiring him, there were several things that I noted -- a) the entrance wound for the first shot (last rib on the left side) was not bleeding because it had some fat and meat pushed out through the hole, plugging blood flow, b) that there was no blood coming from anywhere on his body that I could see, only a little bit from his mouth and nose (consistent with a lung shot), and c) that he was still breathing. By all outward signs, he was unconscious and dying, but I drew my 629 just the same. About this time, he started to wake up, and started to struggle (meekly) to regain his feet. I cocked the hammer of the .44 Mag and sent a 429421 HP though both of his lungs (23.5 grains of W296, 1350 fps). Again, there were several things that were immediately obvious after the shot -- a) that this shot hit him much harder than the first two, b) there was a geyser of blood coming out of the entrance hole, c) that the shot exited, as I could see the blood coming from the exit wound under him in the creek, and d) that he was dead moments later. As we waited for Shane to arrive with the 4-wheeler to haul these hogs out, Steve started telling me about my second shot hitting a branch that was hanging down in front of the black boar, and watching wood fragments shatter in all directions with the shot. I had no clue that I had hit a branch, I had fired in a hurry to keep him from escaping, and then lost the sight picture in recoil. Steve assured me that I had, and that it had been quite dramatic. He even poked around on the creek bank and found the piece of branch that had a fresh .33 caliber bullet hole in it to prove it! Shane came back and found us with his 4-wheeler, and got my hog pulled up and out of the creek so we could take pictures, then he got him loaded up on the trailer and hauled back to the skinning shed. Then he came back and repeated the performance with Steve's red sow. We hiked back to the truck and drove back down to camp for some lunch. It had been a good morning! Glen and the black boar. When we got back to camp, we found Shane and Angie working on our hogs, and Rob was playing "stick" with their dog. As we stood around and got caught up with Rob, Angie found one of my cast bullets, lying flat against the hide, underneath the belly, about halfway between the sternum and the pelvis. From the oblong shape of the hemorrhaged tissue surrounding it, it was obvious that this bullet had come to rest going sideways. A little while later, she pipes up, "Found another one! ", this time in the right "armpit" of the boar. This one was point-on, run headlong into the leg bone. After she finished skinning the boar out, it was possible to track what had happened with each of the shots. The first shot had gone right where I had told it to, entering at the last rib on the left side, raking forward through the lungs, plowing into the right shoulder just as I had intended. I would have expected this bullet at 1700 fps to break the offside shoulder and exit, but there it was, you can't argue with the facts. It is possible that this bullet may have clipped the paunch and that slowed it down (the stomach had been hit, but it wasn't clear which bullet hit it). The first shot penetrated about 30", and would have ultimately proven fatal, but it wasn't doing its job all that quickly. The second shot entered sideways in the upper rear portion of the right ribs, clearly destabilized from its impact with the limb. The line of the second shot would have led it to exit low in the center of the left ribs, but the tumbling bullet instead turned left and down, coming to rest under the belly hide. The second shot penetrated no more than about 18" before coming to rest. The 429421 HP finisher turned in its usual stellar performance, leaving large entrance and exit wounds, both of which bled freely. I really like the 429421 HP. Steve's red sow being skinned. The first shot traveled in a straight line and had gone exactly where I wanted it to go. 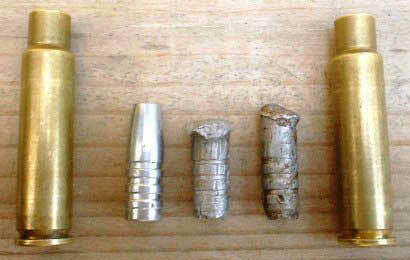 The recovered bullet weighed 201 grains. The second shot had been a tumbling buzz-saw, and had turned and gone in oddball directions because of this tumbling. The recovered bullet weighed 224 grains, and the nose shows scarring from where it hit the limb. 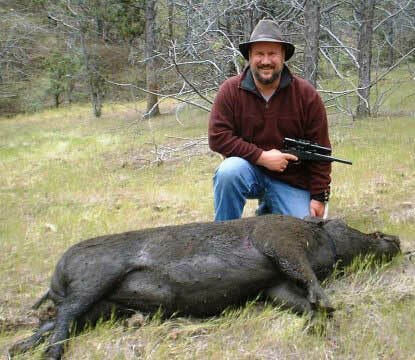 I am convinced that if my first shot had been with a cast HP (like the 33889 HP that I used in the .338 GEF to shoot my last hog with) that this boar would have gone down quickly and none of the other shots would have been necessary. I have also done some experiments with the Mountain Molds 235 GC-FP cast nice and soft to promote expansion (BHN = 9), and I think they would have done a faster job than the moderately hard bullets I was using (BHN about 13). I guess .33 caliber is just a little too small to be using "solids". The next morning, we had a lazy morning, with more of Steve's sausage sizzlin' in the skillet, scrambled eggs, toast and jam. We got out and hiked around the ranch to see what we could see. It was an absolutely bluebird day! We learned a few more things about the ranch and found hogs, Russian boar, water buffalo, fallow deer and jack rabbits. It was one fine morning! Then we went back down to camp, fixed lunch, packed our gear, and settled up with Angie. After the meat was loaded up, we said our goodbyes and hit the road. It was a good couple of days. We had hunted hard and hunted well, we had taken a couple of fine animals that would make excellent table fare, we had spent quality time with good friends, we had talked guns, knives and cast bullets with fellow outdoorsmen who knew how to appreciate such things, and we had enjoyed the beauty of Creation in ways that only a hunter can understand. In short, we had once again refreshed our souls and reminded ourselves of why we hunt.